You may have missed the big news at the end of last week that Crash Bandicoot N. Sane Trilogy isn’t going to be a PlayStation exclusive anymore. Announced via a Nintendo Direct on Friday, the remake of Crash’s first three adventures are headed to Switch, Xbox One, and PC on July 10. While Sony fans may feel like they are losing the exclusivity of their beloved Crash (spoilers: exclusivity was lost long before the N. Sane Trilogy ever came out), there is one thing that will forever remain PlayStation exclusive. Crash Bandicoot N. Sane Trilogy has a number of small references to the heritage and origins of the series. Naughty Dog, the original developer for the first three Crash Bandicoot games, has its presence felt in a few places in Activision’s remake. Crash’s sister, Coco, has a Naughty Dog paw print logo sticker on her laptop. At one point she is watching a scene from Uncharted 4 on that same laptop. Finally, in Crash’s house, there is a picture of Nathan Drake. Based on the trailer shown for the July 10 release on different platforms, each of these Naughty Dog references has been removed. 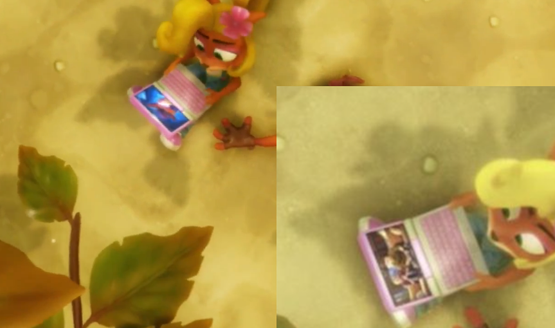 Coco’s laptop is no longer sporting the paw print sticker, she isn’t watching Uncharted 4 on the laptop anymore, and while we don’t get a look at the scene where Nathan Drake’s picture can be viewed, it’s highly likely that frame houses something else on the Switch, Xbox One, and PC. What do you think of the Crash Bandicoot Trilogy Naughty Dog references being removed from versions on other platforms?